"Wan novella" is probably how one editor of The Guardian attibutes Alberto Manguel's take on Gabriel García Márquez's latest effort, Memories of My Melancholy Whores. Wan is being polite. Specifically, Manguel uses phrases such as, "...never seems to extend beyond the mere smutty story", "Even García Márquez's writing...is in these pages flat and conventional", "incomprehensible or banal", "Edith Grossman [translator] has competently rendered García Márquez's simple Spanish into simple English, and generously bettered at times certain uninspired words". 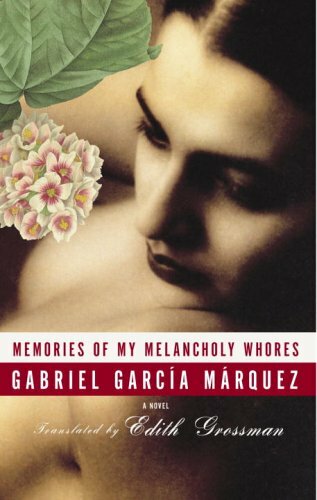 Manguel's competent review concludes with "In Memories of My Melancholy Whores, García Márquez allowed his old Charon to forget, and the resulting memories are not melancholy, not even sad, but merely pitiful and disappointing." Not wanting to be dissuaded by Manguel's compelling commentary, I bought the book off amazon.co.uk as I much prefer their unadulterated and unbowdlerized image of a detail from Rebecca by H.A. von Behr on the dust jacket than the U.S. edition. I received the book in the mail this evening and I finished the book by 10pm. I only wish I had the decades of reading under my belt to challenge Manguel's insightful review. I did enjoy the story for what it was, however. I was not moved beyond the thrill I had for the old man who got to recall his past lovers and still getting it at 90.